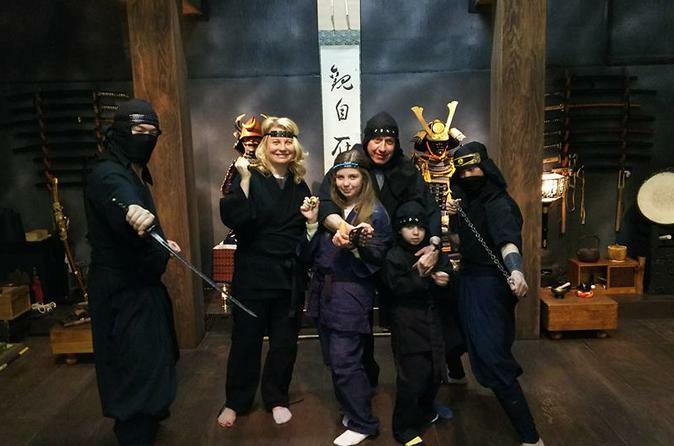 During this hands-on ninja experience for 2 to 15 people, you will start with meditation in ninja outfit, and learn 3 entry level techniques with your ninja instructor. These days, the ultimate goal of being Ninja is to reach and follow the path to Ku or no-self, where there is no conflict. Start this journey of becoming a real ninja. Our interpreter will meet you at the elevator hall of the Kikai Shinko Kaikan 5 minutes before your session. Upon arriving at the Musashi Ninja Clan Honjin Dojo, you will participate in meditation and Kuji-kiri well wishing, and watch an Embu demonstration by your instructor. Then and you will change to your ninja samue (outfit for apprentice). During this 60-minute experience, you will learn to throw shuriken (Ninja star) and to use a blowgun, not to mention walking on silent feet. At the end of the program, you will have plenty of opportunities to strike your best ninja pose. Your Ninja training to walk in the path of Ku as one of us has officially started.